We help companies connect with their customers and make it easy for customers to connect with the company. We do this by creating effective, unique and results driven websites. Each site a unique creation. Thought out with a strategy and measurement tools. Creative layout and interpretation of concepts and ideas using unique design. Your corporate identity built and reinforced on the digital platform. Be seen and heard on Google and other SEO channels. Short, animated video's that educate and inform customers. When you need assistance we're a call or email away. Google recently announced that slow sites would be penalised. Research also shows that slow loading sites cost customers. A lot of care is taken to create super fast websites. 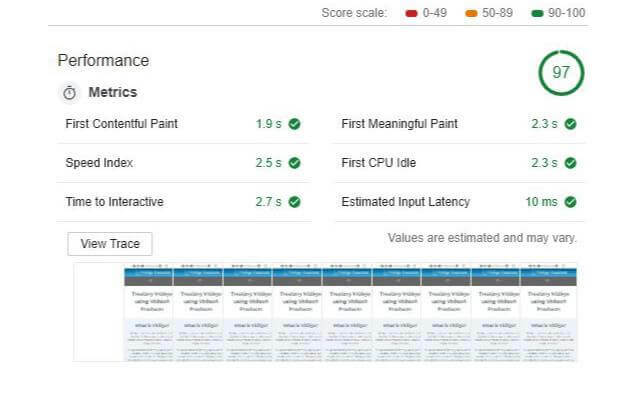 These are screenshots taken from Google PageSpeed Insights and the browser based Lighthouse testing tool. Websites also have to fit on all screen sizes, but especially mobile phones. Most websites show a higher number of visits using mobile phones than desktop or tablet devices. SEO ranking is one of the more effective ways of getting more visitors. Knowing where you rank in relation to your competitors provides great marketing information that you can use to your advantage. See how you rank overall and by individual keyword. Created using the most flexible design platform available.